There is a scene in Invasion of The Body Snatchers where a dog is run over in the street but the inhabitants of the town, now alien, show no emotion. 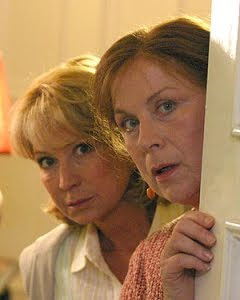 Watching Rosemary & Thyme is a somewhat similar experience. Our heroines set off on a gardening assignment, witness some intrigue, someone dies, you don't care who, it's not important, it's really not important, puzzle is solved, everybody has tea... Agatha Christie looks like Ian Rankin in comparison. There are many shows that follow this same formula but rarely have I seen any quite so banal. Judging from it's rating on IMDB it would appear to be quite popular, a score of eight out of ten is more than respectable. Looking more closely however you realise that this is the result of just over 100 votes, and thus about as reliable as those beauty advertisements that tell you 83% of women noticed an improvement. Perhaps it's dullness is what has enabled it to survive this long. The chloroforming effect of watching an episode ensures plenty of viewers for whom the advertisements really will be a wake up call. Cookery programs.Normally I'd say they rank alongside golf, horse racing, gymnastics and 'reality' television as programming to avoid. So why did I watch an entire hour of cooking programs on the UK Food channel recently? Was it the interesting new recipes? Or was it Nigella Lawson dressed in a silk nightgown whilst gently squeezing the juice from half a lemon? And another thing I find disturbing about volleyball players is their need to perpetually slap each other on the back and high-five each other at every opportunity. I was playing badminton last night and witness to a gratuitous display of affection on the volleyball court next to me. Unfortunately none of them looked like the lady in the picture. At one point, in the middle of their game, somebody must have discovered the secret to harnessing fusion power as they suddenly began to circle each other, like Nike sponsored Morris dancers, "high-fiving" each other as they went. I'd have said something only I don't like to complain. Forgive me for mixing my sports, but give me the Bjorn Borg approach any day. Yes, I know women prefer the McEnroe type but isn't it the silent ones you have to look out for? Admittedly after forty years I've yet to see this theory proven.